The reserve protects sand dunes and boulder slope ecosystems that harbor many native Hawaiian plant and invertebrate species. Seabirds, such as the wedge-tailed shearwater, red-footed and brown boobies, and brown noddy can be seen offshore at Ka‘ena. The reserve provides refuge and a nesting area for the Laysan albatross, and is a potential nesting site for the green sea turtle and Hawaiian monk seal. 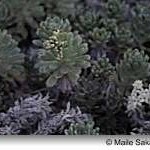 The ‘ohai at Ka‘ena are among the last survivors of a plant once commonly found along the Wai‘anae and Mokule‘ia coastlines. The salmon colored flowers of the ‘ohai bloom among low-lying, silvergreen leaflets. Brought back from the brink of extinction by the protected breeding grounds in the far Northwestern Hawaiian Islands, monk seal populations have risen high enough that some have been visiting even the crowded shores of O‘ahu. The beach naupaka is a common shoreline plant in Hawai‘i. It shelters sand from blowing wind and its roots hold dunes against erosion. The leaves and branches it sheds collect on the dunes and help retain moisture and build soil. Naupaka is easily damaged by off-road vehicles and even by careless hikers and cyclists. Like most plants at Ka‘ena, ‘ilima papa grows close to the ground, where it is less exposed to wind and blowing sand. Perhaps the name, papa (“flat”), evokes its flattened growth form. The orange-yellow blossoms of ‘ilima are the traditional symbol of O‘ahu, and a challenging and delicate material for lei making. During the proper season, usually middle to late fall, pairs of Laysan albatross begin their elaborate mating rituals at Ka‘ena Point. These large, graceful seabirds nest in the open among the native shrubs; vulnerable to pests such as mongoose, feral cats, and dogs. The dark green, rounded naio shrub stands out against the boulder slopes of Ka‘ena. Naio became important in the 1800s when merchants tried to substitute its wood for a dwindling supply of Hawaiian sandalwood. In recent years at Ka‘ena, naio have reappeared while the thickets of introduced koa haole have died back. The ma‘o was once very common on the shores of O‘ahu, but its habitat has been mostly displaced by weeds and coastal development. Ma‘o, meaning “green,” is the color of a bright dye that Hawaiians extracted from the plant. Its delicate, bright yellow flowers grace portions of the boulder slopes at Ka‘ena. With the winter rains, the Ka‘ena ‘akoko sends out its pale green leaves. During the dry summer, it drops all of its foliage. 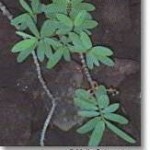 This endangered plant is found only on boulder slopes in the Ka‘ena area, and is easily damaged by trampling. Hinahina means “silvery” and refers to the shiny hairs that cover the leaves and reflect the intense sunlight of the coastal habitat. The white flowers that spring from its tightly-whorled succulent leaves send a delicate fragrance on the ocean breeze. The pohinahina is one of the first plants to colonize coastal dunes, keeping the sand from blowing away. This hardy shrub bears handsome purple blossoms that are a favorite of lei makers and growers of Hawaiian plants. The nehe grows along the coast of most of the Hawaiian Islands. Its light-colored succulent leaves frame bright yellow flowers that resemble minature daisies. Low growing and hardy, the nehe often favors wave-tossed boulder beaches. It is no surprise that the word “nehe” also describes the endless rumbling of the sea.